Level II quotes provide you with essential background market information to help make wise investment decisions. thinkorswim, a trading platform with a reputation for quality tools and resources, provides you with Level II quote data plus support for using that information to your financial advantage. What Are Level I and II Quotes? The Nitty Gritty: What Are Level I Quotes? What Does thinkorswim Level I Market Data Include? What Are thinkorswim Level II Quotes? What Does Level II Market Data Include? Are thinkorswim Penny Stocks Supported? thinkorswim is an investment platform offered by the online brokerage TD Ameritrade. Like other leading platforms, thinkorswim makes real-time level 2 (or level II) quotes available to help savvy investors make smarter choices based on price action – which in turn may signal where stocks are headed next. 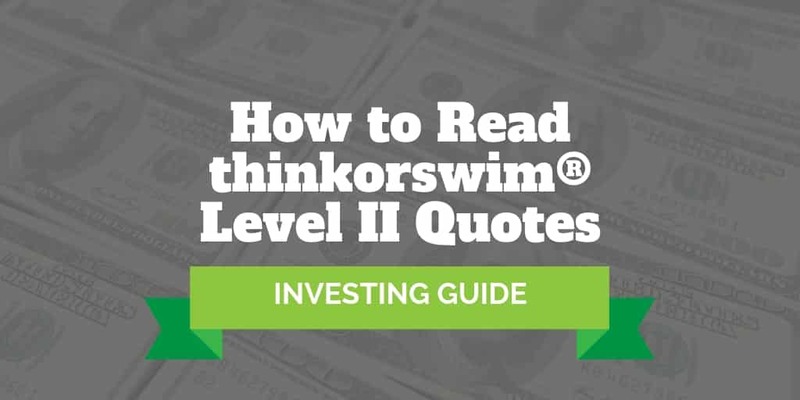 When working with thinkorswim, you’ll be dealing a lot with Level I and Level II quotes. Level I quotes provide the basic information you need to know when you are first considering a trading opportunity, including updated bid/ask numbers and the most recent price stats for a tradable stock. Level II quotes, also known as the order book for NASDAQ, list the top bid and ask prices for virtually every stock on the exchange. By observing Level II quotes carefully, you can potentially spot attractive trading opportunities. These quotes track the trades of market makers, who are actively trading so that you may base your decisions on deeper insights. What Are Level I Quotes? Level I quotes provide the most important stats about an investment, such as the current share price and how many shares are available to purchase. A Level I data sheet also lists the lowest price you may be able to pay for a stock, how many shares you could get at that price, and the price and amount of the most recent stock transaction. thinkorswim neatly organizes Level I data (Bid price, Ask price, Bid size, Ask size, Last price, Last size) so you can easily access the information you need right when you need it. Level II quotes delve deeper into the market by providing more detailed data about the stocks that market makers are trading. Having as much information as possible helps you to track and understand the successful investment strategies of the pros. You may wish to use their strategies to help inform your own buy and sell decisions. You will see Bid data in Level II quotes. This includes several of the top prices and their associated volumes. At this level, you will see a number of the lower ask prices, too, rather than just the one that is the lowest. Each Ask quote includes the number of available shares at each price. In general, Level I and Level II quotes are available from the best online brokers at no cost. Depending on which brokerage you select, you may need to have an account with a minimum balance to access this type of data. TD Ameritrade and its trading platform, thinkorswim, do not charge a fee for Level I or Level II information. And neither do you need to maintain a minimum account balance to trade. However, you must fund your account before trading, and the minimum initial deposit is $3,500. The cost for an account on other online platforms naturally varies, but the minimum balance required ranges from $0 to $10,000. The per-transaction fee is typically between a few dollars and almost 1%, depending on the broker. You can expect your Level I and Level II quotes from thinkorswim to be accurate. Because there is no intermediary between the market and your live data feeds, you will not experience delays due to third-party intervention. With trustworthy data, you can make more informed trading decisions because level 2 quotes are essentially a measure of market liquidity. As a trader, when you see lots of orders filled on the buy side, the stock may be on the verge of moving lower because sellers are attempting to offload their positions, which is likely to drive share prices lower. And vice versa, the stock may be heading higher if lots of orders are filled on the sell side because buyers are looking to gobble up stock. Penny stock traders pay especially close attention to Level II quotes because a single buyer or seller can quickly move the share price of a cheap stock. By spotting where demand to buy or sell shares is strong, “lines in the sand” can be drawn to give traders more confidence where technical support or resistance on stock charts may sit. Trades only take place when buyers and sellers come to an agreement on price. Let’s pretend we have 5 buyers and 2 sellers of say Amazon stock, or any other stock. We’ll pretend the share price is $1,950 to begin. As you can see in the table above, Jimmy wants $2,000 before he’s willing to sell but none of the buyers are willing to pay $2,000 so no transaction occurs. Either Jimmy needs to lower the price he’s willing to offload his shares or one of the buyers needs to boost the price that they are willing to pay. If a new seller comes into the market and decides to sell shares at the price Ann is willing to pay, then the price will decline to $1,900 from $1,950. On the other hand, if one of the buyers realizes there are no sellers willing to come down in price they may decide to increase the price they are willing to pay, which causes the share price to rise. The charts interface on the thinkorswim platform is versatile, flexible and customizable to help you visualize the specific data you are working with, such as Level I or II market data. When you create a chart, the app produces a standard bar graph that maps a stock’s progress over the previous 366 days. You can adjust the time frame, change the appearance and style of the graph or enter new information to produce entirely new perspectives on the stock you are evaluating. Charts are available to show any time frame you select up to a year and a day. You can select “Day,” “Intraday” or “Custom” to choose how often the chart will aggregate and display emergent data on the stock. If you opt for “Tick,” the chart will add a new bar each time the stock reaches a preset number of trades. You can specify any number from 1 → 10,000. The custom option can show you all past data on the stock up to the present day. Thereafter, the chart will update as each day of trading ends. When you initiate a trade on a listed stock, thinkorswim routes your trade through the NYSE SuperDot system. If you initiate a NASDAQ order, the app routes it through one of eight ECNs. It routes options trades to the exchange with the best current market. thinkorswim supports AMEX, PHLX, PCX, CBOE and ISE for options trading. All of the tools you can access on the thinkorswim platform are free to use as a registered basic account holder. The cost to use the platform for professional traders is $200 per month. Other platforms have different fee structures, and these are often tied to how much money you have to park in your trading account. Although this doesn’t cost you anything in theory, the brokerages may earn interest on your unused balance. TD Ameritrade is the online web platform that offers the thinkorswim app. You can use the app interchangeably with the TD Ameritrade platform by linking them together. thinkorswim is downloadable to your Mac OS or your Windows PC (Windows 2000 or later). You need at least 210 MB of free space to install it. You can download thinkorswim to your mobile device, too. This fully functional version works as a standalone app, or you can sync it to your desktop. thinkorswim supports you with rich layers of data, user-friendly tools and multimedia tutorials. This robust platform facilitates a wide variety of securities. If you live in Canada, be sure to get the thinkorswim Canadian app because you cannot trade stocks, bonds, mutual funds, ETFs or some of the other securities on the U.S. version. thinkorswim is best known for its flexible options trading platform with extensive and powerful tools to support your trades. For example, Strategy Roller lets you set your options to roll over automatically, so they remain live until you decide to cut them loose. Both domestic and foreign markets are made available to trade. You even have after-hours privileges on weekdays, with the virtual trading floor open 24 hours. You can choose from 13,000-plus mutual funds with your TD Ameritrade account via thinkorswim. Many are commission-free. The app makes hundreds of commission-free ETFs available for you to trade. These ETFs are hand-selected by Morningstar. thinkorswim also has a variety of pay-to-play ETFs available when you are ready to put your research to the test. With your thinkorswim app synced with your TD Ameritrade account, you have full access to the bond market. Your brokerage account is the standard offering on TD Ameritrade and thinkorswim. You can create an account for free, and the platform does not require that you maintain a specific balance. If you decide to open an account for margin trading, you must keep a minimum of $2,000 in reserve as security for the trading funds you borrow. You will find several options in IRAs through the thinkorswim app, including standard and Roth versions. The app also enables custodial and trust retirement accounts. TD Ameritrade and thinkorswim are not banking institutions like a few of their online brokerage competitors, so they do not offer such banking products as CDs or market-rate savings accounts. Also, as a U.S.-based brokerage app, thinkorswim does not offer Canadian GIC accounts. thinkorswim relies on the latest market feeds to deliver free real-time Level II stats to support and inform your investment strategy. As long as you are trading on a non-professional basis, Level II quotes provide you with enough detailed information to make informed trading decisions but not so much that you become overwhelmed. When lots of orders are filled on the buy side, a stock may be on the cusp of moving lower because sellers are looking to exit positions. Equally, when sell side orders are filled quickly, the stock may be about to head higher because buyers are snapping up shares. You can trade penny stocks on thinkorswim. The platform is connected to QX, QB and Pink Sheet stocks. You can also trade Grey Market securities. thinkorswim has a range of investment products with no minimums.